Running a small business is a challenging endeavor. You have to roll with everything that arises from the economy or your personal life, face every challenge, and keep going. Harvard Business School historian Nancy Koehn extrapolated Abraham Lincoln’s leadership and related it to running a business in the business section of this Sunday’s New York Times. I valued the article quite a bit, and wanted to share some of the insights that I gained from reading it. CEOs from many highly successful businesses find relevance in the lessons to be learned from how Lincoln weathered the death of his son in his personal life and the many painful challenges he faced fighting to hold the U.S. together as one nation. In the New York Times article, Starbucks CEO Howard Schultz reflected on Lincoln’s presence and authenticity as well as his ability to listen to people within his circle and beyond it. The political struggles Lincoln and the people of the US faced during the Civil War (or the War Between the States) were enormous. We may have clashes and struggles today, but they are nothing compared to the bloody battles that consumed our country during that period. Business is fraught with challenges and struggles. Still, with a bit of a bigger perspective, I can draw upon the lessons of Lincoln’s presidency to build and evolve my business. Gathering advice from a wide range of people, especially those who do not agree with us, is critical for any business leader just as it was for Lincoln. He listened to military, political, and economic advisors. We have to listen to customers, colleagues, experts, employees, suppliers, investors, and most of all to our own hearts. There are times when a business transformation calls us to demonstrate the highest of our integrity and an unwavering strength of purpose. Shareholders get antsy when a change initiative takes more than one quarter to show profitability. It takes courage to create lasting change that will positively impact the bottom line over time. When Lincoln decided to announce the Emancipation Proclamation, civil society reacted strongly. According to Koehn, Lincoln’s announcement of the Emancipation Proclamation was a radical act. Personal conflicts arose at every turn. After the Battle of Gettysburg, Lincoln wrote a letter to General George Meade because Lincoln thought he had missed a critical opportunity to destroy the Confederate Army. If Meade had driven after General Robert E. Lee into Virginia, Lincoln thought the North could have vanquished the Confederate Army. After writing the letter, Lincoln neither signed nor sent it. He couldn’t afford to lose Meade’s support at that critical juncture. “Executives face the challenge of navigating their own and others’ emotions with forethought and consideration,” Koehn wrote. We can’t always act on impulse. When someone does something that sabotages our efforts, we can’t just send an email that blasts a person without facing serious consequences. Sending an angry email, tweeting an angry tweet, or posting an angry Facebook post can alienate needed supporters, create a backlash that is hard to overcome, and eat up time, energy, and concentration needed to accomplish critical work. Often in business we have to create a radical transformation if we are going to survive. When our ideas and vision are met with skepticism, ridicule, or downright opposition, we can question ourselves and experience darker emotions. Yet we have to continue to move the business forward, holding fast to the vision of what we want to create, not letting our emotions derail or deter us. Being thoughtful about communication and listening to supporters as well as critics can help us wade through the more difficult moments of organizational transformation. Leading a business is a multifaceted challenge. We have to serve all the people not just our own interests. Lincoln provided a leadership model well worth remembering. 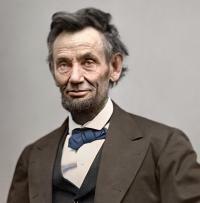 He was able to deal with personal tragedy, institutional transformation, and painful and bloody events of the war while holding to a higher vision of a more perfect union that would be able to serve the needs and sustain the freedoms of the people of the U.S. for generations to come.